#10 Martellus Bennett – TEs are weak but he has a nice upside going against BAL for a TE. #9 Scott Chandler – the Jets can stop the run so they are going to have to throw the ball this week. Look for him to get a few touches this week. #8 Heath Miller – The first REAL TE on this list that has a chance to make a splash this week. #7 Jordan Cameron – Was a boom in the beginning of the season but since the QB situation became a mess his numbers died as well. He is an amazingly talented player but he can’t flourish in such a league without a QB. #6 Vernon Davis – He is one of Kaepernick’s go to guys in the red zone. He has a top 5 TD total and is hungry for more after a slow start. #5 Jordan Reed – Talk about proving oneself to the league. Becoming the asset of a lifetime he is just moving forward every week being a favorite of RGIII. The only better receiver he can have is Terrence Williams from his Baylor days. #4 Antonio Gates – The charger is going against a friendly MIA DEF who can’t block the TE. Look for him to go off against a drama filled Dolphin team. #3 Jimmy Graham – Unless everything is working and they have a big lead expect minutes out of him this week. He is always a top TE option and has been all day. It’s hard for me to see a team with him not in the top 3 of any league unless they had an injury plague this year. #2 Julius Thomas – A day of check downs and small plays for BIG yards with Manning injured this week. He won’t be throwing the deep ball with a high ankle sprain, but he will be giving the ball off to the TE, RB, and Slot receiver all day. 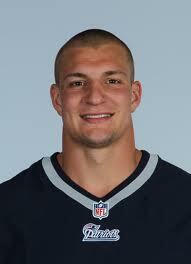 #1 Rob Gronkowski – He will bring back any team from the dead on Monday night. He is Brady’s favorite target and that isn’t changing anytime soon. Expect big things out of him with an offense off the bye week.